Michael Gray, a native of Morristown, TN - “the country of East Tennessee” as he calls it - comes from a long line of musicians and storytellers. He grew up singing in church, as did most of his community. There, he learned about country and gospel music, and his neighbors came together regularly to sing. Michael moved to Chattanooga in 1984 because of a job, and he later started his own business. Throughout his career, he always had the idea to replicate those Sunday afternoons he spent at church, sitting around telling stories, singing music, and enjoying the country life. 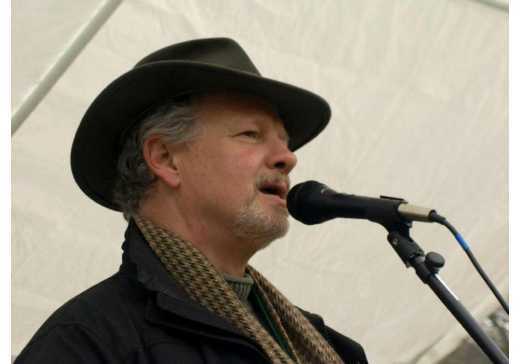 In 2012, after twenty years of dreaming, Michael put his ideas into action when he started the River City Sessions, a variety show featuring local musicians, storytellers, and poets. The River City Sessions is held the second Thursday of every month at the Granfalloon from 7-9pm. It’s also broadcast on WUTC the fourth Sunday of every month at 8pm. Don’t miss the upcoming annual Holiday show on Thursday, December 14. Admission is $5, doors at 7:00pm, show at 7:30pm. There will be songs, stories, and laughter…otherwise, known as good cheer! We interviewed Michael to learn more about his background as a musician and storyteller, the creation of the River City Sessions, and its annual Holiday show. Follow the River City Sessions on Facebook, Twitter, Instagram. How did you become interested in music and storytelling? I was given some voice and piano lessons when I was young, and I also led a choir in the church. I’ve picked up numerous instruments along the way that drive me crazy. My grandfather, who traveled with a tent preacher, taught me how to play the guitar. I’m currently learning how to play the banjo…I’m always taking on some new stringed instrument, including the dulcimer. My aptitude as a musician is “amateurish” compared to other artists on River City Sessions; however, I can carry a tune. As for storytelling, that began for me at a young age because both of my grandfathers would entertain themselves through swapping stories. I’ve always believed traditional Appalachian music is storytelling set to music. Most songs trace back to Ireland and Scotland…music is a way to remember and tell a story. Think about your favorite song and how it hooks you, and almost always, it is trying to bring up a remembrance that you have personally. Right now, I’m recording a CD that will have stories with music on it. I hope to release it in the next three to six months. How did River City Sessions start? River City Sessions started in 2012 and was at first called "Word Fest." I asked a few friends I had met at local jams and other story tellers to get together, and it was going to be a biannual event. The Camp House let us have a show there in the fall and spring. Then, I had an offer to hold it in a larger venue. So I went to WUTC to see if they could put the show on air to finance the larger venue. They said they would do it if I held the series once a month instead of twice a year. And that’s how it became a monthly showcase, which is what it is now, featuring mostly local and beginning artists. I like to highlight the local artists because there is so much talent in this town. I also highlight local storytellers and poets. Mix the music with a poet or story teller or two, and it’s a good formula for us. River City Sessions stayed at the Camp House for almost three years, and now it’s held at the Granfalloon. In addition to the Granfalloon, we’ve also held shows at Sewanee, Ketner’s Mill, the Hunter Museum of American Art, and the Lula Lake Land Trust. Can you tell us about your upcoming Holiday show? Cannon Hunt – A crowd favorite no matter where he performs, Cannon came to RCS when he was just a freshman in high school via a recommendation by Randy Steele, who had been playing with him in a few jam sessions. Since then, he has become a favorite not only of RCS but all over town and has made a few solid recommendations of his own to RCS. Grace Campbell - A local singer song writer, she has been singing since she was four years old, whether with her family or in choirs. Her initial influence comes from the Good Shepherd Church Choir in Lexington, Kentucky. However, after teaching herself to play the guitar in 2014, her songwriting was able to take form. Recently, she has been involved in several bands, including her own family band, August385. She has gained experience through participating in these bands while also attending school at Sewanee: The University of the South. Derek Martin – Derek recently became the engagement manager for The Camp House here in Chattanooga. In naming him such, they got a two for one deal, because Derek is a very talented singer songwriter also. He has appeared twice recently at shows RCS has been involved in; the RCS monthly show and in The Tree Top night headed by Kristy Graves over at Chattanooga House Shows. Both times, he performed original music as well as solid covers that highlighted the range of his voice. Joylene Kara – Also a newcomer to the Chattanooga music scene, Joylene has an acoustic folk singer sound but has also fronted a rock band and is another who has a range of voice and talent. Help us welcome her to the Chattanooga music community. Tennessee’s music is varied. I started the River City Sessions featuring traditional Appalachian music and then transitioned to traditional Tennessee music. There are several traditional routes, not only in Tennessee but in Appalachia. Bluegrass is influenced by old time music. Blues are influenced by delta music. RCS has had some jazz singers, with influences from New Orleans to Chicago. But all of these genres have become a part of this larger melting pot we call traditional music. We can’t ignore the fact we have Nashville 140 miles to the northwest. We can’t ignore the fact we have Bristol 220 miles to the northeast. We can’t ignore the fact the further west you go, the more you hear the delta blues until you get to Beale Street. It’s all traditional. Does Chattanooga have a sound? Chattanooga has a couple of really strong traditions in bluegrass. 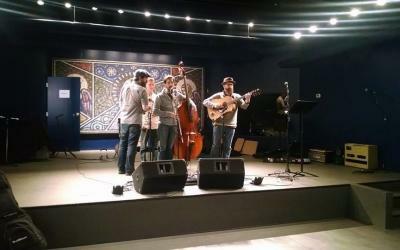 The bluegrass community has over sixty different bluegrass jam type events going on in Chattanooga every month. But we also have the influence of Bessie Smith and the blues that were here on 9th street in the forties. Those two brands would have to be included in the sound of Chattanooga. And then, don’t forget, there’s the gospel influence. Everywhere we’ve talked about you can find a gospel influence. Most people learned how to play music in church. I really enjoy watching the city’s growth and the change here, and seeing the people who are coming to be involved in it. I consider Chattanooga to be a good example of what a growing city can be. I discover something new every week. I also love our outdoors scene...all of the hiking, kayaking, fly fishing, and camping you can do…all within one hour of town! I almost always go home to upper East Tennessee and spend Christmas with my family. I smoke a ham or a turkey, which I’ve done for the past thirty years. However, last year, I passed on the tradition to my son, who just bought his own smoker. It’s quite an elaborate affair, and I know he’s enjoying the fruits of his labor. And of course, we all sit around on Christmas afternoon and tell stories, and almost always, some neighbors will drop by to join in impromptu.